Welcome to another Gliebers Dresses Executive Meeting. Chip Cayman (Independent Marketing Consultant): "... Glenn will be back next week, fully rested from his staycation. And I'm 100% convinced that Dorothy will be glad to have him out of the house! There are only so many things that can be fixed in a home, you know?! Roger, you probably know all about this topic!" Chip Cayman: "I asked Kevin to join us today, so that we could go over customer reporting from the past thirty days. Kevin, the C-Suite awaits your commentary." Kevin: "Ok, let's take a look at the data. The dashboard in front of you (click on the image above) illustrates a series of very simple metrics that outline why sales are increasing or decreasing. I usually look at a rolling twelve months of data, so that I can compare metrics without needing to consider any adjustments for seasonality." Roger Morgan (Operations and IT): "That is one way to look at the information. Anytime I run metrics for finance, I like to create five year views of the data as well." Kevin: "The top half of the table illustrates how well we're doing at retaining existing customers. The bottom half of the table illustrates our effectiveness at reactivating older customers and acquiring new customers. Pepper Morgan (Interim Chief Marketing Officer): "This report suggests that we did a worse job of retaining customers over the past thirty days, is that correct?" Kevin: "Just barely. The annual retention rate dropped from 53.20% to 53.15%, not a significant decrease. There are two problems right now. A third of our problem happens because the business has been in decline for awhile, so we simply have fewer existing customers to generate sales. Two-thirds of our problem happens because customers are actually purchasing fewer items per order, at a slightly lower price point." Lois Gladstone (Finance): "Shouldn't our loyalty program cause the opposite outcome? For the past month, we've been heavily promoting the fact that if a customer buys four dresses, then the customer gets free shipping for the rest of the year. We should see an increase in retention, and an increase in items purchased per order, right? But so far, we aren't seeing an increase." Kevin: "If the program is working, then theoretically, yes, you will see an increase in those metrics." Lois Gladstone: "We've been promoting this for the past thirty days, have we been speaking with the right audience?" Chip Cayman: "We have to give this loyalty program time, folks. We simply cannot expect the customer to see the obvious value in this program and respond immediately." Pepper Morgan: "What is happening with new and reactivated customers, Kevin?" Kevin: "The vast majority of decline in demand among new and reactivated customers is happening because there are simply fewer new and reactivated customers. We have fewer customers, in large part, because of the cuts in customer acquisition marketing." Lois Gladstone: "And those cuts were in unprofitable areas, so our profit and loss statement is going to look better because we made those cuts." Kevin: "As you can see, this creates a 'circular logic problem', if you will. We begin next month with 3,410 fewer twelve month buyers than we began last month with. Assuming that the loyalty program will work, we'll have fewer customers to feed into the loyalty program." Candi Layton (HR & Chief Customer Officer): "If we have fewer customers, does this mean we'll have fewer orders in the call center in the future?" Candi Layton: "Does this mean that, if we're losing 2% of our demand per month, we might lose as much as 24% of our demand over the next year? Kevin: "If every month replicated the results of the past thirty days, then yes." Candi Layton: "And that means we'd have to ultimately reduce hours in our call center and distribution center again, given that the business is shrinking this much." Lois Gladstone: "That's why we're really promoting this loyalty program. We absolutely need to increase the number of loyal buyers, to prevent that from happening." Candi Layton: "But we started the new program a month ago, and already, the metrics are pointing in the opposite direction." Roger Morgan: "Fortunately, our website conversion rate has increased over the past thirty days." Pepper Morgan: "That's because we're doing less customer acquisition, so we're driving better traffic to the website, traffic that converts at a higher rate." Roger Morgan: "Maybe the loyalty program is making a difference, causing customers to be more motivated to order when they visit the website?" Pepper Morgan: "Then wouldn't the customer metrics illustrate improvements?" Roger Morgan: "From what you've shown us, open rates and click-through rates in the e-mail campaigns where we've communicated our loyalty program are up, and website conversion rates are up. So at some level, the loyalty program has to be working, or those metrics wouldn't all show increases. Maybe this is a merchandising issue, maybe the business would be down even more than this if we hadn't started the loyalty program?" Chip Cayman: "Let's not get into pointing fingers, here. We need to give the program a chance to succeed. Meredith, you have a lot of merchandising metrics that suggest we're making big improvements, right?" Meredith Thompson: "Our back-to-school strategy is really doing well, it is up 24% compared with last year. And we have a new line of professional dresses that are up 39% compared with last year. So we have plenty of successes." Roger Morgan: "Maybe the economy isn't doing us any favors. If conversion rates are up, if e-mail metrics are up, if many of the merchandising metrics are up, if our loyalty program is kicking-in now, then our business should be improving, right?" Kevin: "There are a few challenges, here. Customer metrics are the aggregate of marketing strategy, merchandising effectiveness, and economic conditions. Some metrics are pointing up, some are not doing so well, and so the net impact is a negative. By and large, there is a file momentum issue, fueled by a decrease in customer acquisition. 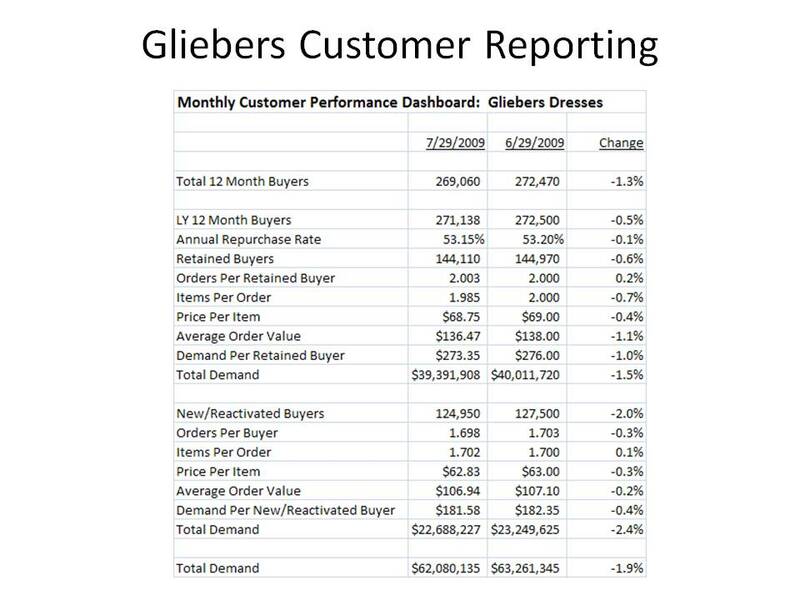 No matter how many metrics improve, the business will continue to struggle as long as there are fewer and fewer customers available to purchase again from Gliebers Dresses." Pepper Morgan: "Good thing we're using Kevin's Zip Code Forensics tool to find new customers more efficiently, that should help us." Chip Cayman: "How much does that cost us?" Pepper Morgan: "It's free to any business that sells via e-commerce, right Kevin?" Chip Cayman: "Free? Kevin, you're a dufus. I could sell that tool into packaged goods companies at $100,000 a pop. Good consultants know how to monetize their activities. Look at me, for instance. I don't do these Executive Meetings for free, you know." Kevin: "We'll do a revenue share, we'll split incremental profit based on a percentage that you determine, how's that?" Chip Cayman: "I'd need Glenn's approval for that, and you know that he loves free marketing, so that won't happen. Anyway, once this loyalty program really takes hold, we should see improvements in retention rate, orders per buyer, and especially items per order. Improvements in those metrics should hopefully offset any customer file momentum issues. Now on to the next topic, before we wrap up. Glenn wants me to remind all of you to explain to all of your employees that, for the second consecutive year, there will not be a contribution to the profit sharing plan. Glenn did decide, however, that he will bring back the 'lottery' system for a second year, whereby three lucky employees will be drawn at random to receive a $10,000 contribution to their profit sharing plan. Executives will once again not be eligible for this lottery." Chip Cayman (Marketing Consultant): "... and that's when the six of us met at the hotel bar, drinks on me! That's a 'tweetup' folks, that's the real power of Twitter! How would we have ever gotten together without the burgeoning power of social media? Oh sure, the critics will say that we could have just sent e-mails to each other or could have made some sort of public announcement, but that completely misses the point. These social media Luddites keep nit-picking the details, they fail to see the power of the whole." Meredith Thompson: "Chip Cayman is leading the meetings this week, Kevin. Glenn Glieber is taking a 'staycation' this week. Anytime Glenn is out of the office, Chip takes over the meeting. Glenn wants to make sure that all of us on the Executive team ..."
Candi Layton (HR and Chief Customer Officer): "You know, we should be called 'The C-Suite', that's how the media refers to Executive Teams at other companies." Meredith Thompson: "... makes sure that all of us in the 'C-Suite' realize that we're all equal in stature, that one isn't more important than the other." Chip Cayman: "So let's get down to business. Lois, where are we at on implementation of the loyalty program? Lois Gladstone (Finance): "The program has been in place since July 1. 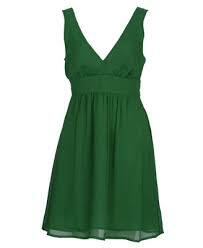 To date, no customer has purchased the four dresses required to earn free shipping for the year. From a financial standpoint, that's wonderful. But we're not yet seeing the improvements in loyalty that we anticipated." Chip Cayman: "Kevin, is it possible that we're missing something here?" Kevin: "Multichannel Forensics suggest that the average customer will purchase twice a year, two dresses per order. I'd expect to see a buildup in customers entering the program this fall. Not nearly enough time has passed to make any conclusions about the effectiveness of the program." Chip Cayman: "Fantastic. Roger, where are we at on the 'Website 5.0' project?" Roger Morgan (Operations and IT): "We're making good progress. Component 2.0 of the Website 5.0 project is scheduled for implementation on August 31. Component 3.0 and Component 3.1 of the Website 5.0 project are scheduled for implementation on September 30. Components 4.0, 4.1, and 4.2 of the Website 5.0 project are scheduled for implementation on October 31. Component 5.0 and Component 6.0 of the Website 5.0 project will not be implemented until early 2010, due to the Holiday systems moratorium. We simply won't implement any new projects during the busiest shopping season of the year." Chip Cayman: "Outstanding. Pepper, have we overhauled the contact strategy yet?" Pepper Morgan (Interim Chief Marketing Officer): "Kevin and I presented our strategy last week, we'll be implementing the new strategy in January." Chip Cayman: "Good! Candi, how is the new 'Gliebers Listens' social media initiative going?" Candi Layton: "We're really picking up steam. Listen to the metrics, folks! Our Twitter presence now has 1,294 followers ..."
Chip Cayman: "One at a time, folks. Go ahead, Candi, continue." Candi Layton: "We have 1,294 followers. Catch this. We put up a tweet last Monday. We said 'Glenn Glieber believes in treating customers like family. And this week, you, our family, are eligible for a 20% discount on one item only!" That comment was re-tweeted 86 times! Re-tweets garnered us another 447 followers." Meredith Thompson: "Did anybody purchase anything because of our Twitter presence?" Candi Layton: "Oh, that's not what 'Gliebers Listens' is all about. We're here to participate in the conversation, to listen to what is happening, to treat the customer with the respect she deserves. The sales will happen later." Meredith Thompson: "How do you know the sales will happen later?" Candi Layton: "Because we're building actual relationships with customers, Meredith. Let me give you an example. @jessica_partygoddess tweeted last week. She said 'A seam ripped on my new dress from Gliebers. Pure rubbish. Don't buy from Gliebers.' Well, I tweeted her, I said 'I am so sorry to hear that. I will refund your order, send a new dress, and enter you in our loyalty program for free.' We eventually connected, I refunded her order, Roger sent her a new dress, and Lois made sure she was enrolled in our loyalty program. That's what 'Gliebers Listens' is all about, Meredith. What's also important, Meredith, is that we get to the bottom of quality issues with our merchandise." Meredith Thompson: "Quality issues? We don't have any quality issues." Candi Layton: "Of course we have a quality issue. @jessica_partygoddess said we have a quality issue. She told every one of her 92 followers about problems with the quality of our dresses." Meredith Thompson: "How do you really know she had a quality issue. Did you ask to have the dress sent back to us so that we could inspect it?" Candi Layton: "Well, no. I thought that would make for a bad customer experience." Meredith Thompson: "Let's do that next time, so that I can inspect the dress." Pepper Morgan: "And why was she auto-enrolled in our loyalty program?" Candi Layton: "Because I thought that would make for a good customer experience." Lois Gladstone: "So let's better understand this. We hear a customer complain about a quality issue. We send her a free dress, and we offer her free shipping for the next twelve months. This customer will have to purchase five incremental dresses in the next year, just to cover the cost of this 'Gliebers Listens' interaction." Chip Cayman: "Lois, that's not at all what Gliebers Listens is all about. You only chose to focus on what we're giving away." Candi Layton: "We should really focus on the quality issue." Meredith Thompson: "Let's get more than one customer criticism, let's compile the evidence that there is a quality issue, and then yes, I'll be happy to focus on quality. Do we have a database that sums all of the sentiments on Twitter, so that we can truly discern if there is a pattern around comments related to quality?" Roger Morgan: "Kevin, is there any way we can better utilize Candi's information"? Kevin: "Absolutely. Companies are actively creating social media databases. In other words, they record every interaction that happens in Twitter or in the blogosphere. They record the twitter user who says something, they record the sentiment, be it positive or negative. If the Twitter user is an existing customer, they create a link from the social media database to the customer database. This allows the company to mine the relationships to understand the relationship between Twitter activity and customer loyalty." Roger Morgan: "Wow. We could do that!" Pepper Morgan: "You could use that information to better mail catalogs or deliver e-mail campaigns, correct?" Kevin: "Certainly. You can also understand if you change the perception of a person on Twitter. If a person was saying negative things, and then Candi's actions cause the person to say positive things, you can use the social media database to understand how the people who interact with the Twitter user act, going forward. You can use the social media database to actually measure if Candi's activities are resulting in sales improvements. 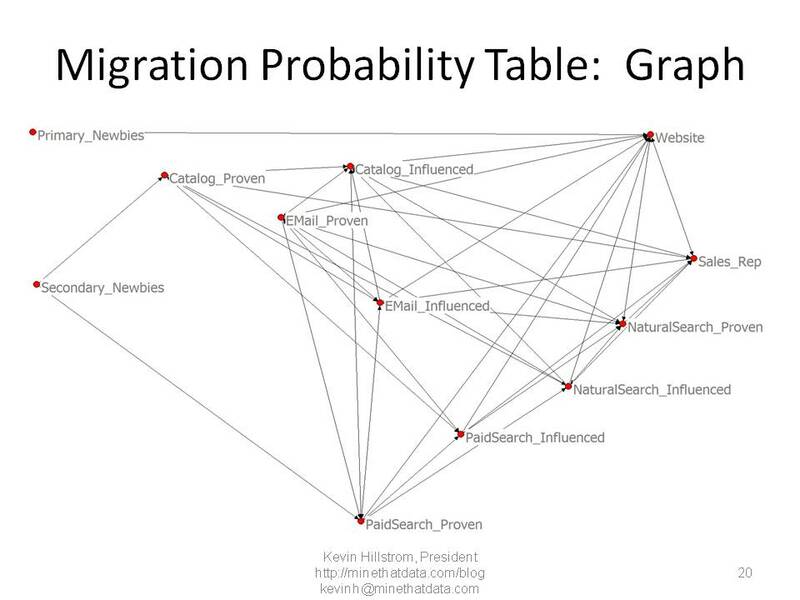 Fortunately, almost nobody is doing this level of database integration today, so you have a real opportunity to get a head start using Twitter from a database marketing perspective. The social media database is a part of the Twitter story that is fundamentally missing when folks talk about having a 'conversation'." Roger Morgan: "Let's get that on the book of work!" Kevin: "And it doesn't have to take up a lot of resources, Roger. Have a half-dozen folks in your contact center work with Candi to tabulate this information. Have your IT team integrate their tabulations into a social media database. Then have Boris Feldman (Bow Tie Guy) analyze it." Chip Cayman: "Ok folks, that's enough for one day. Good meeting!! Now on to the next topic on the agenda. Next Tuesday at 9:00am, in the Hoodie Dress conference room, we'll invite all employees to watch my new video, 'How To Cultivate Deep Customer Relationships 140 Characters At A Time'. This video is designed to teach all employees how to use the free micro-blogging tools that are revolutionizing global micro-communications. There's no reason every Gliebers Dresses employee should not be using these tools to build customer relationships. This is modern CRM folks!" Roger Morgan: "Which conference room is the Hoodie Dress conference room again?" This article makes the case that multichannel marketing, cross-channel marketing, bricks & clicks, whatever you want to call it, is one of the secrets to sales growth. It's an interesting argument, supported by metrics. There are other metrics to look at. Back on March 16, 2007, I selected two groups of stocks ... one set of stock represented online and online/catalog brands, while one set of stocks represented "multichannel" brands, brands with a retail channel to support the online/catalog brands. Online Brands: Amazon, Blue Nile, CDW, Dell, Drugstore.com, eBay, Overstock.com, PC Connection. 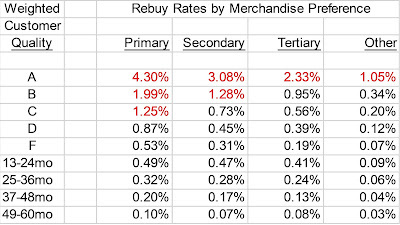 Retail Brands: Best Buy, Cabelas, Circuit City, Coldwater Creek, Eddie Bauer, J. Crew, J.C. Penney, Nordstrom, Office Depot, Office Max, Talbots, Williams Sonoma. I compared the price of the stocks, on March 16, 2007, and today, July 27, 2009. Online/Catalog Brands: The average value of these stocks decreased by 17% during the last 28 months. Retail Brands: The average value of these stocks decreased by 65% during the last 28 months. Excluding two bankruptcies (Circuit City & Eddie Bauer), the average value of these stocks decreased by 58% during the last 28 months. There are many ways to slice and dice data. In many cases, sales are aggregating among larger companies. This doesn't mean this is the best way for a business to be more profitable. Run your multichannel forensics analytics carefully, so that you thoroughly understand how your customers interact with channels. The right answer lies in your own customer data, not in the analysis of stocks, or in the analysis of aggregate sales totals. During the dog days of summer, we're going to explore some of the unique challenges that online marketers face when measuring business performance. One of the biggest challenges online marketers face is conflicting metrics. For instance, this article suggests that Starbucks and Dell greatly benefit from their social media efforts. That sounds good, of course, until you realize that Starbucks is struggling mightily, suffering from a 75% drop in profit in the first half of the most recent fiscal year. In the case of Dell, they are about to be passed for second place in computer market share by Acer. So did Social Media help these companies stem what would have been even bigger declines? Or do the metrics in the article fail to measure reality? It's hard to know the truth, we cannot easily separate out the positives and negatives. In online marketing, we constantly face these challenges. We work really hard to improve conversion rates, we'll make ten or fifteen improvements, only to learn that we have metrics to prove that the improvements made a difference --- but actual annual sales and profit did not increase. For the remainder of the summer, we're going to couple our Gliebers Dresses story with a series on Multichannel Forensics and Online Marketing. In some ways, we'll explore how the concepts in the book Moneyball apply to online marketing --- we'll talk about how our metrics and KPIs and dashboards give us information that isn't always aligned with the business results we're seeing. We'll talk about how we might use tools like Multichannel Forensics to give us insight into what is actually happening. Gliebers Dresses: Which Number Is Right? Glen Glieber (Owner): "... but these kids don't know the difference between an SCF and a KPI, instead, they're all about PPC! They're simply not aware of the fundamentals anymore. Meredith, you remember Stu Bletsky, don't you? Oh, he was a trail-blazer. He was one of the first ones to make the "two for" strategy work ... you know, you have a dress for $59, and he'd offer you two for $99. Or what about Art Popper and Mildred Rosen, and the things they did to advance catalog pagination? They studied every single spread in a catalog, trying to find the right combination of presentation and copy. Those folks, they really knew their stuff. Oh, the good times we all had." Meredith Thompson: "Ok, Kevin, we've got a few questions for you today, and we're glad you here to help, now that Sarah Wheldon is telling all of our trade secrets to Anna Carter." Pepper Morgan (Interim Chief Merchandising Officer): "Here we go. Kevin, what reporting should I be looking at, to understand business performance?" Roger Morgan (Chief Operations Officer): "Let's just look at online demand for the month of June. In our order entry system, that's the system I use, it says we generated $4,000,000 of online demand online during the month of June." Pepper Morgan: "But in the customer database, it says we generated $3,725,000 demand in the online channel during the month of June." Meredith Thompson: "That's because the customer database subtracts canceled orders. My merchandising system says the online demand total for June is $4,125,000. Our number is probably right because we included canceled orders for demand forecasting purposes, and we include employee orders, whereas the order entry system doesn't include employee orders." Pepper Morgan: "But if you are analyzing true customer performance, you want to exclude employee orders, right?" Candi Layton (Chief Customer Officer): "No, you need to keep employee orders in the database, because eventually people like Sarah Wheldon aren't employees, and then you need to analyze former employees just like they were customers." Meredith Thompson: "Well, I need to forecast employee orders, because I have to have enough inventory for them. And then employee orders screw up my gross margin numbers, because if too many employees order merchandise at a discount, then my gross margin numbers are lower." Lois Gladstone (Chief Financial Officer): "Our systems report a different gross margin number than do the merchandising systems, because we like to plug all marketing discounts into the cost of goods sold. We usually don't do discounts unless we're having a problem selling the merchandise, so the discounts are truly part of the gross margin metric. And we don't care about demand in finance, we really only care about net sales." Meredith Thompson: "My merchandising systems care about demand, because we have to forecast the right number of units sold, then we have to forecast returns too. We have to have both metrics to do our job right." Pepper Morgan: "And in Marketing, Sarah always had marketing discounts as a line item in her profit and loss statement, so that she could see the impact of the discounts as a percentage of advertising expense." Roger Morgan: "When we offer discounts and promotions in the call center, like if a customer is really mad at us and we want to give her free shipping, we just pick up one of the old marketing promotions and use that code. Sure, that taints the reporting marketing looks at, but it does make the customer happy." Candi Layton: "It is important to keep the customer happy, so I support that." Pepper Morgan: "Then how do I truly know if my marketing promotions are working, or if operations is artificially inflating the total?" Lois Gladstone: "Can't we just buy one of those off-the-shelf ERP or CRM or BI or MRM or SAP systems, and then the system will just know how to categorize everything for us? I'd really like to see every employee using the same point-and-click system to get the same metrics, you know, have everybody speaking off of the same page?" Roger Morgan: "Oh, that's a really big project. I think we'd have to put that one on the book of work and prioritize it against all of the other initiatives. And it is expensive, too. We're really in a situation here where we are simply filling potholes. Let's look at the big picture, folks. When we're profitable, then we can think about tacking a project of this scale." Pepper Morgan: "We also have our web analytics tool. That tool tells us that we generated $3,200,000 online during the month of June, why is that number so different?" Roger Morgan: "We know why that number is different. The web analytics tool only captures about 80% of the sales transactions. It's a level of error that our web analytics vendor says we can feel comfortable using." Lois Gladstone: "So does that mean that our conversion rate is truly 8%, or is it better because we're missing 20% of the transactions? Is our conversion rate actually 9% or 10%? And how about all of the other metrics that Bow Tie Guy quotes from our website, can we trust any of them if 20% of the purchase transactions are missing? Is our shopping cart abandonment metric truly bad, or is it just fine? Do customers truly drill deep into the site, or do they only look at the home page? How does this impact all of the other metrics?" Meredith Thompson: "You also have the concept of demand, you know, being different online vs. on the telephone. If an item isn't available in the catalog, we record it as demand in the telephone channel. Online, we pull the item off the site if it isn't available, and as a result, we don't record that the customer ever wanted to buy the item. As the mix of demand shifted over the past decade to the online channel, this has really helped us achieve a much better final fulfillment rate, and ultimately, better bonuses for my employees!" Kevin: "My personal belief is that you have different metrics for different reasons. However, I believe that there should be one set of metrics that are communicated to every employee in the company. Those metrics are shared between the finance department and the marketing department. Demand, initial fulfillment, final fulfillment, returns, gross margin, promotional discounts, orders, advertising expense, all of those metrics are basically owned by finance. Marketing is responsible for communicating customer metrics like repurchase rates, orders per customer, items per order, discount dollars per customer, average order value. Marketing and Finance work together to make sure that metrics tie out. Operations/IT is responsible for implementing all systems related improvements to make sure that Marketing and Finance are in sync." Roger Morgan: "Do you really believe that Finance owns metrics? That seems like something that I should own." Kevin: "I like to see metrics development as a collaboration between marketing and finance, because finance is responsible for publicly publishing profit and loss information. Almost nobody ever questions the metrics in the profit and loss statement. And the profit and loss statement is influenced by marketing, so there has to be collaboration between the two parties. Information Technology needs to support the two systems, and assist in selection and implementation of the appropriate software tools and dashboard platforms. Marketing leads the implementation, because marketing owns the customer, and most of the data at the core of the company is customer related. Information Technology owns the data schemas necessary to link merchandising, finance, marketing, web analytics, and operations. Information Technology never forces metrics upon employees. Marketing is responsible for determining the customer metrics that are communicated to all employees." Roger Morgan: "Oh, I don't agree with that at all. My information technology team can come up with some really innovative metrics. I think marketing should just execute promotions and send catalogs and e-mails to customers. I'd rather see the people who know the data the best, the information technology folks, spend time analyzing the data and sharing what the metrics say." Pepper Morgan: "Bow Tie Guy is responsible for all of the customer reporting. Are you suggesting that your team is better equipped than he is at analyzing and communicating customer metrics to the company?" Roger Morgan: "Absolutely. I'm sure he's good, don't get me wrong. But he's not a trained information technology leader. My employees are in a different pay grade for a reason, they're more talented and their skills are more in-demand than the typical marketing geek. It's simple economics, really. And honestly, when people have ad-hoc requests, they come to me, and my team runs the ad-hoc customer queries for them. Just last week, I ran a query for finance, and told them that the average customer has 1.7 purchases over the past five years in the customer database." Pepper Morgan: "You mean those requests don't go on the book of work? And what the heck are you doing? Kevin told us that the average twelve-month buyer purchases about twice a year. So what is the context around 1.7 purchases?" Roger Morgan: "Oh, well, we didn't look at just the last twelve months. We wanted to give finance a 'holistic' view of the customer, using data for the past five years. I don't think twelve months is the right timeframe to analyze customer behavior." Candi Layton: "Seems to me that you'd want to look at at least two years of data, so that you could get a little trending, but you wouldn't want five years, because our business really changed over the past five years." Lois Gladstone: "I like three years of data, that causes us to look at data at the peak of the housing bubble through now, rock bottom. That makes for a good representation of history, in my opinion." Kevin: "Well, you've articulated the issues, and you've gotten a lot of points of view out on the table. It is my opinion that Finance own all metrics related to the profit and loss statement, while Marketing owns all customer related metrics and advertising related metrics. It is the job of Information Technology to implement the wishes of Finance and Marketing. It is the job of everybody else to trust those accountable for the three areas I outlined. Nobody tells finance how to calculate profit. Nobody tells information technology folks what software tools they should use. Similarly, other departments could better support marketing when marketing reports on customer behavior." Glenn Glieber: "Another stimulating discussion, folks. It's all part of being a matrixed organization with shared accountability. Matrixed organizations are what multichannel brands are all about --- no silos here! Now, on to the next topic on the agenda. Penny Crandall down in inventory management wants to see us implement a series of landing pages that better support sales of the merchandise she is responsible for." Pepper Morgan: "That's probably something I can work with her on." Meredith Thompson: "Shouldn't merchandising have input on this issue?" Roger Morgan: "Well, I'm responsible for the website, so maybe we're better off having my team work with Penny on that topic." There are two types of advertising channels in the Multichannel Forensics framework. The proven channel is what we enjoyed back in the 1980s and early 1990s. We mailed a catalog. Then the customer ordered from us, and was kind enough to provide us with a key code, allowing us to track with accuracy the proven channel that drove the order. Oh, those were heady times. These days, everybody is obsessed with fractionally allocating orders based on the advertising channels that they perceive to be driving orders. First touch? Last touch? Allocation across touches. Of course, all of the allocation rules are bogus. We don't really know, do we? Especially if we don't do mail/holdout groups, and you really cannot do mail/holdout groups for paid search (though you can do some innovative spend/no-spend strategies). So why the obsession with first touch, last touch, and fractional allocation? The end result is clouded with fiction, anyway. There's another way to approach this challenge. Instead of investing all of our efforts on the art of allocation, why not categorize orders based on proven and influenced sources, then track how customers evolve over time --- allowing us to reduce catalog or e-mail marketing expense in the future? Catalog received on June 1. E-Mail received on June 3. Order on June 5, using Pay-Per-Click. One could label pay-per-click as the "proven" source. One could also label catalog and e-mail marketing as "influenced" sources --- in theory, these advertising channels influenced the order. Here's the marketing analytics secret for you --- shhhhhh, don't tell anybody! When catalogs and/or e-mails move from "proven" to "influenced" advertising sources, you don't have to send as many of these to the customers using them as "influenced sources" in the future --- once customers move away from these advertising channels as their primary reason for purchasing, they become less likely to use them in the future. 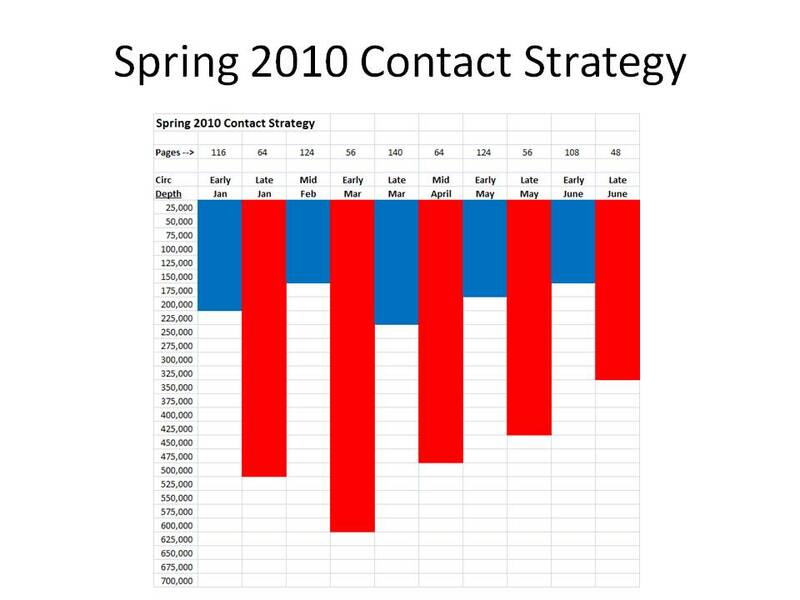 Fractional allocation or first touch or last touch cannot provide you with this marketing analytics secret --- all of these forms of allocation just allow you to make guesses about what happened in the past. We need to know how to market to individual customers in the future. This is where Multichannel Forensics, and micro-channels in particular, make a big difference. Glenn Glieber (Owner): "... so I never, EVER, expected this. Anna Carter sent out a press release this morning, announcing that Sarah Wheldon, our very own Sarah Wheldon, has been hired as a Sr. Vice President of Consumer Insights. That's bad enough. But get this, folks. The press release says that Ms. Wheldon is immediately cutting off list rental and list exchange activities with all major competitors. This means that we no longer have unfettered access to the Anna Carter buyer file. As the kids say, 'OMG'." Meredith Thompson: "Kevin, have you run the scenario I asked you to run for us this morning?" Kevin: "Yes, I ran it. You have the slide in front of you. Basically, Anna Carter is saying that you can no longer rent or exchange lists with them. 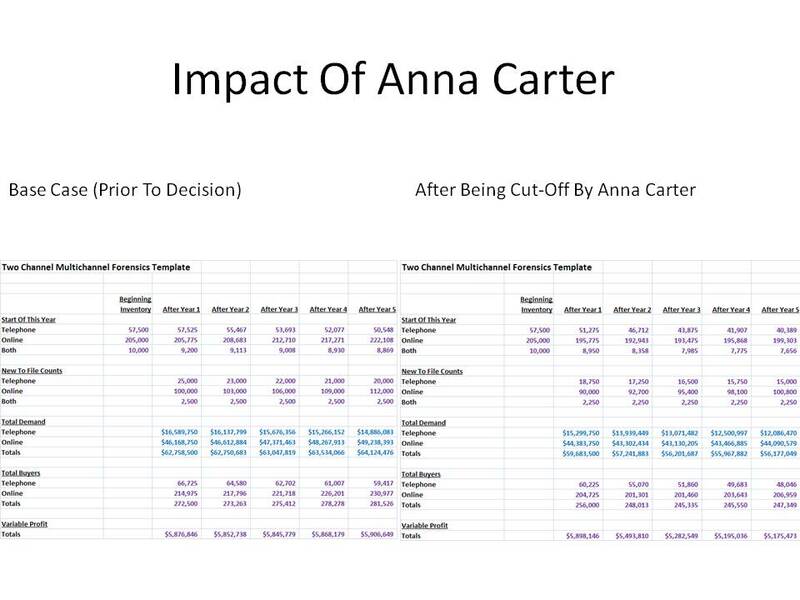 At this time, 13% of the new customers you acquire are from the Anna Carter customer file." Roger Morgan (Operations): "You must be kidding. Are you telling me that without access to the Anna Carter customer file, we will lose 13% of our new customers?" Kevin: "Unless you find a new source of names to replace those you'll lose, then yes, that's what I am saying." Candi Layton (Chief Customer Officer): "Kevin, are you saying that we rent and exchange names with other companies?" Pepper Morgan (Interim Chief Marketing Officer): "Yes Candi, renting and exchanging names with your biggest competitors is an established best practice in the catalog industry." Candi Layton: "How long have we been doing this?" Meredith Thompson: "About forty years." Candi Layton: "Forty years? Are we nuts? How many customers absolutely hate us for doing this? This is a terrible customer experience. A customer trusts us, she buys from us, and the minute the transaction is complete, we rent her name to another company --- worse, we rent her name to our biggest competitor? Think of all the trees we cut down, for no good reason. Do we pay the customer royalties each time we rent her name?" Meredith Thompson: "Absolutely not. But we do make about $250,000 a year in sheer profit by renting our customer base to competitors. Right now, that income is the difference between us being profitable and having to lay off another five employees." Kevin: "Ok, here's what the slide says. If we are not able to gain access to new names that perform as well as the Anna Carter list, then the customer file will begin to decay. Over the course of the next five years, Gliebers Dresses will lose $2.5 million in profit because there won't be enough new customers to fuel the growth of the business. In five years, the business will be at $56 million instead of $64 million. That's what the data in the slide tells us." Pepper Morgan: "Wow. I love Multichannel Forensics! But I hate what it tells us." Roger Morgan: "She's downright vengeful, that Sarah Wheldon. How can she do this to us? Didn't we offer her a generous severance package when she retired?" Candi Layton: "Absolutely. But she elected to not sign the document. She turned down a boatload of money to stay retired for a year. Had she taken the money, she couldn't work for any competitor for one year." Roger Morgan: "She's basically their Chief Marketing Officer now. Maybe that's not so bad. A recent Neptune Research report said that the average tenure of a Chief Marketing Officer is only 23 months, so she won't be there all that long." Roger Morgan: "I'm just saying that's the average. The average CMO at Gliebers Dresses lasts longer." Meredith Thompson: "You know, we're going to have to be nimble, here. This is something like five percent of our circulation that just disappeared for the Fall. Can't we just go to our favorite co-op, ResponseShop, and just ask for replacement names?" Kevin: "You could do that, though the names probably won't perform all that well. That being said, there aren't a lot of short-term options available. However, there will be names that come out of the merge that you'll get through the co-op that are on the Anna Carter mailing list, so you'll get some of the sales back that way." Candi Layton: "Can you explain what a co-op is?" Meredith Thompson: "A co-op is a company that we send the name and address of all of the customers who recently purchased from our business. 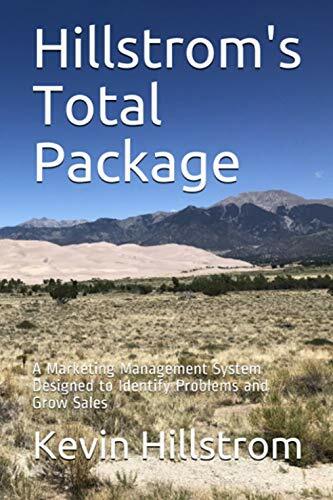 The co-op compiles this information from numerous competitors, creates a bunch of equations and algorithms that rank-order potential customers from best to worst, and then sells the best customers to all of us. We get to mail names that haven't purchased from us for something like $0.04 or $0.05 or $0.06 per name --- the rates vary based on the size of each business, and the ability of somebody in the legal or marketing department to negotiate the best possible rates. We get one time use of the name." Candi Layton: "Does the co-op pay a royalty to the customer, since the co-op is making all of this money off of the customer?" Meredith Thompson: "Oh heavens, no, Candi." Candi Layton: "Does the co-op pay a royalty back to us, like in list rental?" Candi Layton: "So let me get this straight. We rent out our list to competitors, and we get a royalty. We also get access to their buyers, so that we can grow our business. And then we willingly provide name and address to this thing called a co-op. They basically re-shuffle the deck, pull out all of the black cards, and then re-sell us the good red cards, the face cards that we don't already have, if you will. We don't get a royalty, and the customer isn't paid a royalty, but the co-op gets paid over and over and over and over and over and over again for the same name and address. That's the business practice we've been engaging in for the last forty years?" Meredith Thompson: "Yup. Well, we've only participated in the co-ops for the past thirteen years." Candi Layton: "How does the customer benefit from all of these shenanigans?" Meredith Thompson: "I don't think of these as being shenanigans, I think they are best practices." Lois Gladstone (Chief Financial Officer): "I don't think the customer benefits at all. Everybody seems to be profiting from the customer --- especially these co-ops, but the customer just ends up with a mailbox full of catalogs from Anna Carter that she never asked for. This is why we need to focus on customer loyalty and get out of this expensive customer acquisition stuff." Candi Layton: "I'm thinking we should put a six month moratorium on all list rental and co-op activities, until we can think of a better way to protect our customer." Meredith Thompson: "Have we collectively lost our minds?" Roger Morgan: "Didn't Chip Cayman say that social media is a great way to get new customers for free?" Kevin: "Ok folks, I've been listening to this conversation, and you're going down an interesting path. I just ran a quick scenario, assuming you discontinued all list rental and co-op mailings. If you choose to do that, your business begins to erode ... to $48 million this year, then $37 million next year, then $31 million, then $29 million, and finally $28 million. Worse, you'll lose a lot of long-term profit ... $8.7 million over the next five years. Essentially, you'll be out of business." Candi Layton: "You mean if we stop abusing our customers and we stop abusing the customers who shop from competitors, we'll be out of business?" Kevin: "The secret is to find new ways to acquire customers, new ways that do not, as you say, 'abuse' the customer. Until there is a strategy in place that allows you find new customers in a cost effective, 'opt-in' manner, you are tethered to the list rental and co-op business model." Roger Morgan: "That Sarah Wheldon really stuck it to us, didn't she? Think about this. She tethers us to a horrible list rental and co-op practice that isn't customer friendly, then retires, then goes to our biggest competitor and cuts us off when she knows darn well that we have to have access to these names or we go out of business. She's been playing us all along, I think." Meredith Thompson: "Impossible. We've worked with Sarah forever, decades in my case. She's angry at us, and Anna Carter took advantage of a golden opportunity to put a stake in the heart of a competitor." Pepper Morgan: "It's so much worse than sticking it to us, Roger. Remember last night when we were talking over dinner about all of the Multichannel Forensics stuff we've learned over the past two months? Well that's all common knowledge now, because Sarah Wheldon is at Anna Carter, and she's going to share every single detail with those folks --- every single detail. She'll tell them the ins and outs of our loyalty program, she'll tell them about our five year sales forecast predicated on customer behavior across channels. She'll tell them that we retain 53% of our buyers. She'll share the results of every mail/holdout test that Bow Tie Guy executed. They're already thinking of shutting down the catalog, now they've got more data to support either side of their decision. And if they are going to shut down their catalog, they don't care about participating in list rental, they don't care about being in the co-ops." Lois Gladstone: "That Sarah Wheldon really stuck it to us. We need to take legal action against her." Candi Layton: "What would you have done if you were Sarah Wheldon?" Lois Gladstone: "I would have taken the money and truly retired. I'd be sitting on the deck of a cabin in Northern Vermont drinking Jagermeister every night." Candi Layton: "That money only lasts for a year or so, then what? You eventually need to go back to work. We all knew this day was coming, we just didn't expect it to happen two days after she officially retired from Gliebers Dresses." Glenn Glieber: "It's time for us to move on, the past is the past. We survived Rebecca DeBarton and Chance Hawthorne. We'll survive Sarah Wheldon, too. Now let's go to the next topic on the agenda. We need to find $100,000 to fund Candi Layton's customer initiatives. Pepper, I'd like to see where in marketing you can cut the budget so that we can fund her customer initiatives. Please have a plan on my desk by 4:00pm today."